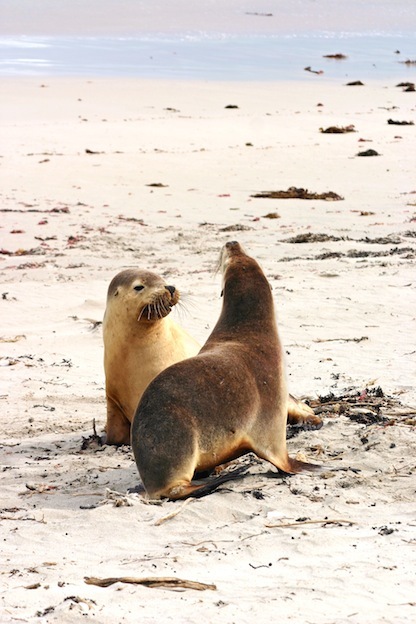 Male Australian Sea Lions are dark brown with a light yellow mane around their heads. The females are silver in color and they don’t have the mane at all. The males are extremely large, and often up to three times bigger than the females. This species of Sea Lion is found both on the Western and Southern coasts of Australia. They are very social creatures, and you can find them communicating often with each other. While they form very large colonies on the land, they also have sub groups that are more intimate. They average 10 to 15 per sub group and they can move from one to another as their needs change over the course of their lives. Australian Sea Lions consume large amounts of food. They feed on any fish they can find, squid, and other creatures that are found in the waters that contain meat. They swallow small prey and tear larger prey into sizable chunks. They also have back teeth that can be used to crack shells if needed to get to meat. They have been known to consume small penguins if necessary to survive. The reproduction process for the Australian Sea Lion is very different from that of other Sea Lions. They have an 18 month cycle rather than one 12 months in length. Most of the time a colony has a breeding season of four months with the other species. However, the Australian Sea Lion has an open window of up to 9 months. Another difference is that the males can mating with five females in turn. Pair of Australian sea lions (Neophoca cinerea) in Kangaroo Island, South Australia. They show an aggressively fight for the right to mate with any female around that is in estrus. This will occur about 10 days after she gives birth to a pup. She will only be in estrus for about 24 hours. The males will also kill her young pup she has just given birth with to show aggression and to get her to mate. It is believed that the females will have a pattern of returning to the same location again and again to give birth to their pups. That is why it is vital that conservation efforts are in place to protect their natural habitat. Females may stop mating if they can no longer access that location for giving birth. It is believed there is a mortality high rate of the pups which means that it is hard to get the population up. Under the National Parks and Wildlife Act of 1972, it is illegal to harm or kill an Australian Sea Lion. Even with such protection in place there isn’t more than 10,000 of them left in the world. They are considered to be an endangered species and that means plenty has to be done if they are going to survive. With the right conditions they can live up to 25 years in the wild and even longer in captivity. It is believed that the numbers are still dropping and it really isn’t known why. There has been funding put into place for in depth studies of the Australian Sea Lions to take place. That way information can be compiled that may help focus conservation efforts on the right elements. The main reason there are so few Australian Sea Lions is due to the early hunting of them. This took place in both the 18th and 19th Centuries. They were hunted so that their blubber could be used for oil, for a source of meat, and to make leather goods. There is still a huge problem of them being injured or drowning due to getting tangled up in the nets of fishermen.